Place 2 tortillas on ungreased cookie sheet; spread with pizza sauce. Top with salami slices, mushrooms, 1/2 cup of the cheese and remaining tortillas. Broil 6 to 8 inches from heat for 1 to 2 minutes or until tortillas are lightly browned. Turn quesadillas over; sprinkle with remaining 1/2 cup cheese. 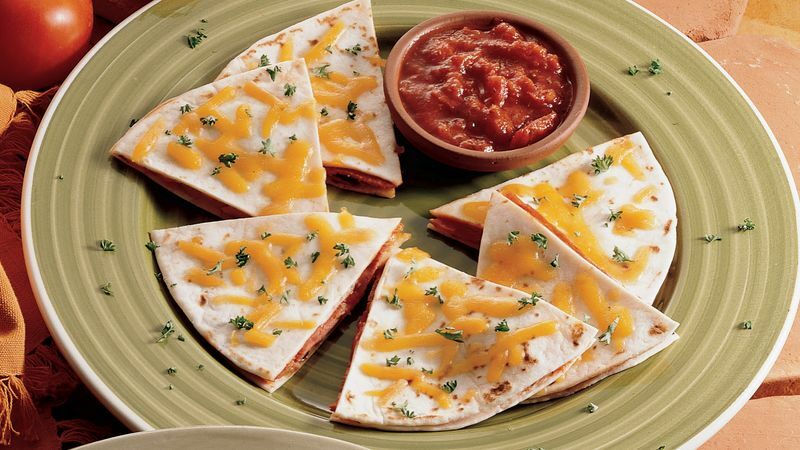 Broil an additional 1 to 2 minutes or until quesadillas are light golden brown and cheese is melted. Sprinkle with parsley. Cut into wedges to serve. If desired, serve with additional heated pizza sauce. The recipe can be made with whole wheat flour tortillas. To easily turn the quesadillas, use 2 large flat spatulas. Instead of the salami and mushrooms, fill the tortillas with your favorite pizza toppings, such as thin slices of green bell pepper, pepperoni, onions or even pineapple.